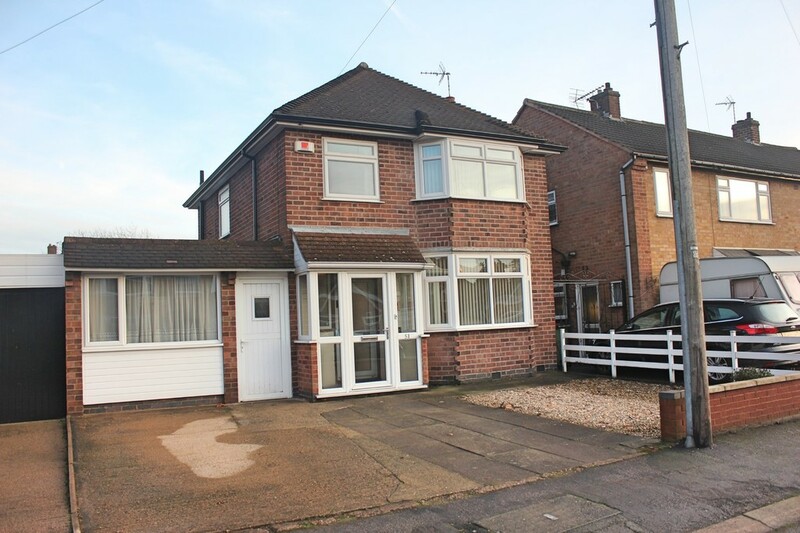 A well presented and extended detached family home located close to the centre of Wigston. The accommodation comprises porch, entrance hall, extended lounge diner, kitchen, rear lobby, downstairs w.c., additional reception room, three bedrooms, wet room, good size rear garden and off road parking. The property is being sold with ‘No Upward Chain’. For more info or to view call Phillips George on 01162168178. SUMMARY A well presented and extended detached family home located close to the centre of Wigston. The accommodation comprises porch, entrance hall, extended lounge diner, kitchen, rear lobby, downstairs w.c., additional reception room, three bedrooms, wet room, good size rear garden and off road parking. The property is being sold with ‘No Upward Chain’. For more info or to view call Phillips George on 01162168178. ENTRANCE HALL With under stairs storage area, cupboard housing the meters, radiator and stairs off to the first floor. LOUNGE 14′ 1" x 11′ max (4.29m x 3.35m) Having gas fire and fireplace, bay window to the front elevation, coving to the ceiling and radiator. DINING ROOM 17′ 3" x 7′ 9" (5.26m x 2.36m) With coving to the ceiling, windows to the side and rear elevations and radiator. KITCHEN 10′ 1" x 9′ 2" (3.07m x 2.79m) Comprising base and wall mounted units with complementary work surfaces, sink unit with drainer, tiled splash backs, gas cooker point, built in fridge, extractor fan, window to the rear elevation and access to the rear lobby. 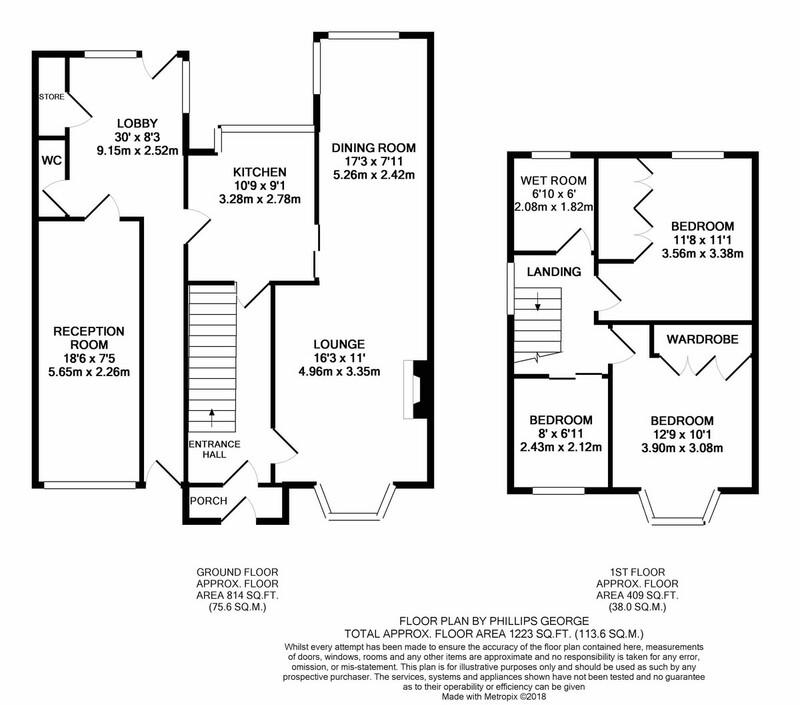 LOBBY 11′ 6" x 8′ 3" (3.51m x 2.51m) With door to the rear garden, windows to the side and rear elevations, storage cupboard and door to the front of the property. WC Having low flush w.c. and tiled floor. RECEPTION ROOM 17′ 9" x 7′ 4" (5.41m x 2.24m) With window to the front elevation. LANDING With window to the side elevation and access to the loft. The loft is insulated and part boarded. BEDROOM 11′ 9" plus bay x 10′ 2" (3.58m x 3.1m) Having built in wardrobes, bay window to the front elevation and radiator. BEDROOM 11′ 8" x 11′ 1" (3.56m x 3.38m) With built in wardrobes, radiator and window to the rear elevation. BEDROOM 7′ 11" x 6′ 11" (2.41m x 2.11m) Having coving to the ceiling, security alarm, window to the front elevation and radiator. WET ROOM 6′ 10" x 5′ 11" (2.08m x 1.8m) Comprising walk in shower area, pedestal wash hand basin, low flush w.c, heated towel rail, tiled splash backs and window to the rear elevation. OUTSIDE The front of the property is paved and pebbled and provides ample off road parking. The rear garden is a very good size and mainly laid to lawn with patio area, flower borders, outhouse, shed and a hedged and fenced surround. VALUATION Thinking of selling? We would be delighted to provide you with a free market appraisal/valuation of your own property. Please contact Phillips George to arrange a convenient appointment on 01162168178.